When you’re on the go and barely have enough time to stop for a cup of coffee, let alone drink one, that’s when you need a caffeine boost the most. Dragging your luggage through the airport, bus terminal or city streets means you’ll need a third hand to carry your stuff and your coffee. While we don’t know of an surgeons willing to attach any extra limbs, we do have a much simpler solution. 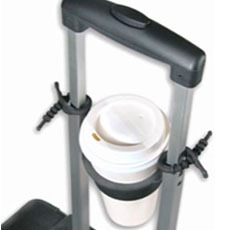 Tugo is a cup holder that attaches right to the handles of your rollings luggage and lets you keep your coffee close at hand… well at least until the TSA takes it away .